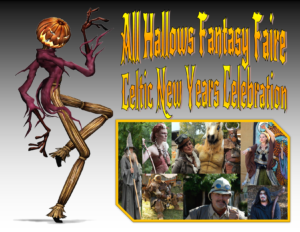 The 10th Annual All Hallows Fantasy Faire is a two day all inclusive costume play Celtic New Year’s Celebration! The Faire is deeply rooted in the beliefs of the Celtic people, but combined with all the fun and excitement of a modern Halloween. This year there will be a magnificent fire show and The Burning of the Harvestman. There will also be live music, vendors, and a costume contest. Kids 12 and under enter for free. Weekend or day passes available.